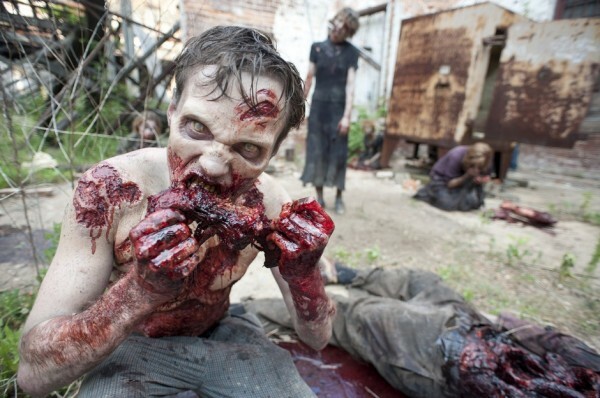 The Walking Dead is known for using real-life raw meat as prosthetics for actors so that zombies—as well as the occasional other human actor—can take bites out of humans that look much more realistic than other foam or latex prosthetics. Typically, actors have a choice of biting either chicken or beef, but in a recent episode from season 5, “Four Walls and a Roof,” there was an additional option to make this scene look just as realistic: pork. Lawrence Gillard Jr. (Bob Stookey) was killed off in this episode, but not before a cannibalistic community lead by Andrew J. West (Gareth) barbecued Gillard’s leg for their dinner that night. To make this scene come to life, the special effects crew used small pieces of roasted pork, blackened on the outside to match Gillard’s skin tone (pictured below). You can watch West and some others in his group chowing down on Gillard’s leg nonchalantly in this gruesome scene here. Near the end of season 4, Andrew Lincoln (Rick Grimes), the lead role of the series, had the pleasure of taking a big bite out of a human’s neck in order to save his group from the harm of another. It was reported to The Guardian that Lincoln had the option of biting into chicken or beef and whether it would be cooked or raw. He asked Greg Nicotero, the director, which he believed would be more realistic to human flesh. 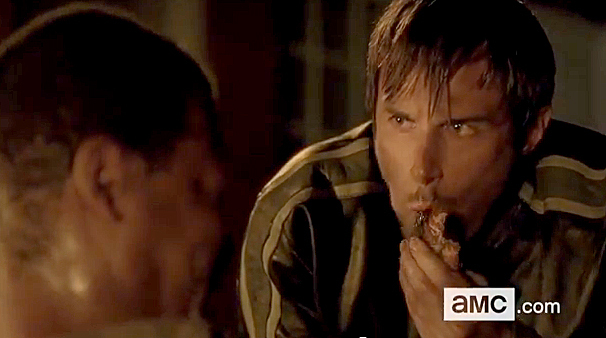 When Nicotero said raw would be better on camera, Lincoln, probably thinking about his strong desire to maintain the portrayal of realism on set, opted to dig his teeth into raw chicken. You can see the incredibly morbid and frightening scene here. After filming these gut-wrenching scenes for the show (buh dum tss), I don’t blame the actors for turning to vegetarianism. People make the choice to eat a plant-based diet for numerous reasons, and it turns out that being disgusted by raw meat from it resembling human guts and flesh is just another viable motive. As far as the show has revealed, Norman Reedus hasn’t ever even had to bite anyone, so it’s interesting that he’s one of the leading roles that has become a vegetarian; I guess that’s what years of watching zombies tear apart human flesh can do to a guy. As for Andrew Lincoln, after he had to viciously bite a “human’s” flesh from right off of their skin with a demonic look on his face, I don’t know how he, or anyone else for that matter, could ever look at chicken the same way again. The only question I have left is whether or not they will use tofu chicken and beef in later episodes to accommodate their now-vegetarian cast!